The declaration below represents the beginning of a democratic process leading towards a second People’s Assembly in early 2014. This declaration represents the views of all those who initially called for the People’s Assembly. We hope it will be endorsed by the People’s Assembly on 22nd June. It will then be open to the local People’s Assembly’s, union bodies and campaign groups who support the People’s Assembly to suggest amendments, additions, or deletions. These will then all be discussed and decided upon at the recall People’s Assembly in 2014. The plans for action are simply the most obvious rallying points for a national anti-cuts movement for the remainder of 2013. They are not intended to supersede local or sectional action by existing campaigns or trade unions. They are intended to be focus national, collective action by the whole anti-austerity movement. We face a choice that will shape our society for decades to come. It is a choice faced by ordinary people in every part of the globe. 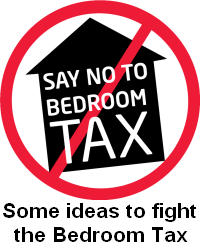 We can defend education, health and welfare provision funded from general taxation and available to all, or we can surrender the gains that have improved the lives of millions of people for over more than 50 years. We do not accept that government’s austerity programme is necessary. The banks and the major corporations should be taxed at a rate which can provide the necessary resources. 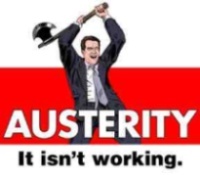 Austerity does not work: it is a failure in its own terms resulting in neither deficit reduction nor growth. It is not just: the government takes money from the pockets of those who did not cause the crisis and rewards those who did. It is immoral: our children face a bleaker future if our services and living standards are devastated. It is undemocratic: at the last election a majority voted against the return of a Tory government. The Con-Dem coalition has delivered us into the grip of the Tories’ whose political project is the destruction of a universal welfare state. We therefore choose to resist. We refuse to be divided against ourselves by stories of those on ‘golden pensions’, or of ‘scroungers’, or the ‘undeserving poor’. We do not blame our neighbours, whatever race or religion they maybe. We are not joining the race to the bottom. We stand with the movement of resistance across Europe. We are clear in our minds that our stand will require us to defend the people’s right to protest, and so we support the right of unions and campaigns to organise and take such action as their members democratically decide is necessary. We stand with all those who have made the case against the government so far: in the student movement, in the unions, in the many campaigns to defend services, the NHS, and in the Coalition of Resistance, the People’s Charter, UK Uncut, the environmental movement and the Occupy movement. We do not seek to replace any organisations fighting cuts. All are necessary. But we do believe that a single united national movement is required to challenge more effectively a nationally led government austerity programme. We have a plain and simple goal: to make government abandon its austerity programme. If it will not it must be replaced with one that will. We will concentrate on action not words. We aim to provide the maximum solidarity for unions and other organisations and others taking action. We support every and all effective forms action and aim to build a united national movement of resistance. Our case is clear. The government’s austerity programme does not work; it is unjust, immoral and undemocratic. Alternatives exist. Debts can be dropped. Privatisation can be reversed and common ownership embraced. A living wage can begin to combat poverty. Strong trade unions can help redistribute profit. The vast wealth held by corporations and the trillions held by the super rich in tax havens can be tapped. Green technology, alternatives to the arms industries, a rebuilt infrastructure including growth in manufacturing are all desperately needed. We are fighting for an alternative future for this generation and for those that come after us. The People’s Assembly will support every genuine movement and action taken against any and all of the cuts. We support all current industrial actions by the unions. We encourage and will help to organise the maximum solidarity action with the PCS and teaching union members taking strike action the week after the People’s Assembly, as well as with other action by unions planned for the autumn. Peoples Assemblies against the cuts should be organised in towns and cities across our nations, bringing all those fighting the cuts together into a broad democratic alliance on a local basis. The national and the local Assemblies, in partnership with Trades Unions, Trades Councils, campaigning and community groups, can unite our movement and strengthen our campaigns. Local Assemblies will help us to organise a recalled National Assembly to review our work in the early spring of 2014. We will work together with leading experts and campaigners both here and abroad, and friendly think tanks, to develop rapidly key policies and an alternative programme for a new anti-austerity government. We will continue to welcome support from all who fight the cuts. We will call a national day of civil disobedience and direct action against austerity. We will call a day of co-ordinated local demonstrations in the early autumn. We will work with the trade unions and others to call a national demonstration in November. Right, that’s enough, now what are we going to do about it? He continues to use this slogan, this son of a 17th baronet, worth £4 million and heir to many millions more, as he explains the necessity of cutting public services, libraries, pensions as well as payments to the poor, the disabled, and those who will never inherit a single baronetcy, no matter how hard they train for it. For the poor to pay a major contribution towards the crisis created by the bankers would be a screaming injustice, but it’s so much worse than that. Because one of the few professions that doesn’t have to cough up is the bankers themselves. And to ease their pain of watching everyone apart from themselves suffer, one of the few measures taken by this government that gives more money away rather than less has been a tax cut for the richest one per cent. But the coalition’s outrages are only part of the frustration felt by so many. Because there can hardly have been a time when so many people, disgusted by their government, have been at such a loss as to what we can do about it. Until recently, many people found a home for their anger at social injustice in the Labour Party. But the New Labour years, if we’re being harsh, weren’t all that successful at promoting peace and equality. Although there are Labour members who are wonderfully effective, such as Tony Benn and Owen Jones, many of their activists left or became disillusioned. Left wing groups have collapsed more spectacularly, in a series of crises that makes you wonder whether their activities are organised by the scriptwriters of Eastenders, leaving another layer of socialists and campaigners in confusion. But another piece of this jigsaw of frustration is that the basis for an opposition is evident. The government is by no means overwhelmingly popular, and the Lib-Dem part of it widely held in contempt. Anyone who watches Question Time knows the easiest way for a panellist to win a round of applause is to make an angry speech about greedy bankers. When a few hundred activists moved into tents under the ‘Occupy’ banner, they won the sympathy of millions and forced ministers to appear on the news making unconvincing attempts to justify their actions. When an opposition has appeared credible, it has won an astounding level of support – such as when George Galloway won the election in Bradford, or when Caroline Lucas was victorious in Brighton for the Green Party. Campaigns such as the one in Lewisham to prevent the closure of the A&E department at the hospital have amassed tens of thousands of supporters. But for the most part these moments remain in one area, or pass quickly, then it’s back to yelling at the telly, or if you’re really dedicated, the radio as well. Would it be possible, I find myself thinking, to bring together those who share these frustrations, to connect with each other? Some people are already in groups or parties, such as UK Uncut, the Greens or Labour, but I’m sure they’d acknowledge there are many people beyond their own supporters who’d be willing to contribute towards a squabble with George Osborne. It might be tempting to consider these thoughts, then conclude you’d done your bit by thinking them, and if you wanted to do any more you could occasionally arrange them into a moan. But it seems – since enough people are thinking this way at once – that a genuine movement is possible. For example Owen Jones, one of the most eloquent opponents of the Coalition’s austerity, is eager to help set up such a network. Salma Yaqoob, who many will know as an inspiring opponent of the war in Iraq, is another. Caroline Lucas, the Green MP, feels the same, as does Laurie Penny, the journalist who wrote powerfully as part of the Occupy movement. The trade unions are committed to establishing this network, which can link the campaigns, the meetings, the petitions and the squeals of anguish that try to prevent the cruelties of austerity. Almost every major union has pledged to back such a movement, which it will call a ‘People’s Assembly’. And crucially, many of this large and growingly frustrated TV-abusing section of society have greeted the idea with enthusiasm, and even a hint of optimism. For example a single letter in a newspaper announcing the Assembly attracted hundreds of initial supporters. So this is the plan. Many possibilities can open up once the connections are made. A group in one part of the country can discuss how to support a campaign to defend a hospital in another part. Even a joint letter to a local newspaper is an improvement on a lonely individual seethe. It will be a network that embraces supporters of different groups and parties, as well as those with no affiliations. And it will bring together enough people eager to participate, who would rather do something than nothing, who would rather find themselves alongside others who agree than remain on their own. The evidence suggests that wherever a community unites and campaigns to defend its hospitals, its libraries, it parks and its people, it succeeds at least in part. The aim of the People’s Assembly will be simply to tap into the vast amount of humanity, imagination and wit of those who wish to curtail the injustices swirling around us, and create a place that we all feel better for being in, and all feel better for having helped to create. And you can carry on swearing at George Osborne on the telly as well if you like. So leave a name or a message if you’re interested and we can add it to the many who have already said they are, and to show I’m fair, I’ll even let you leave a name and a message if you’re not interested and think I’m completely round the sodding bend.